Yeah, it’s another Pokémon comic. I know that the second to last random strip I did was a Pokémon one. Still, I’ve had this one sitting in my sketchbook for a while and thought I would finally finish it. I don’t really have a point for this comic. 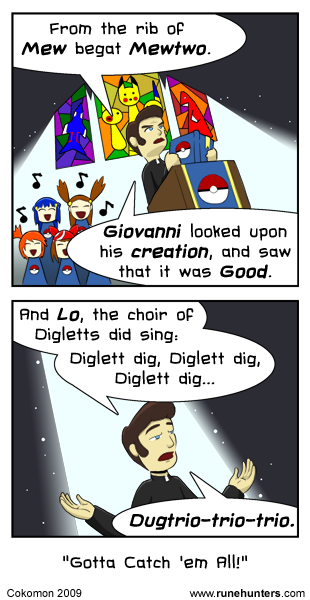 I don’t know if it is supposed to be a fan who has taken their obsession too far or if this is actually what church is like in the Pokémon world. Also, yes, the choir girls are based on various characters from the show and games. No, the priest is not based on anyone from the series.